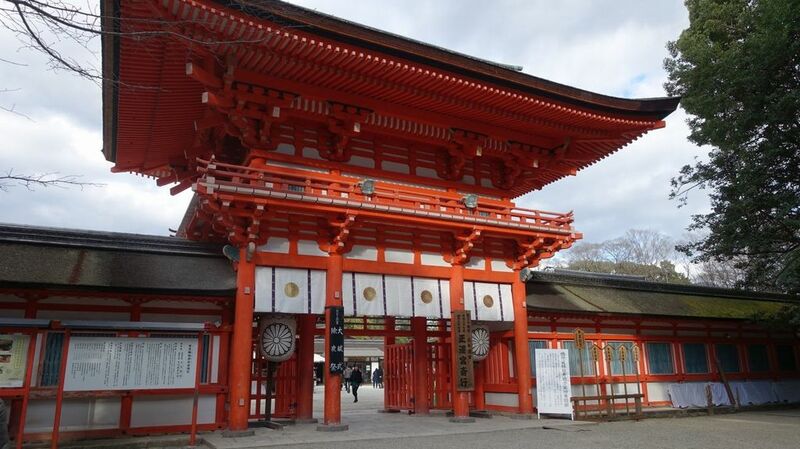 Shimogamo Shrine is one of the oldest shrines in Kyoto, is located at the junction of the Takano and Kamo rivers. It is surrounded by the Tadasu no Mori, a forest which was preserved during the modernization of the city and contains trees that are up to 600 years old. Its history goes back to ancient times. This shrine was originally established for the purpose of worshipping as a deity the head of the Kamo family, who wielded great power in this region at one time. The main shrine is designated as a National Treasure. It was rebuilt in the middle of the 19th century. There are the two main buildings: the sanctuaries (the buildings which enshrine the deity) on the east and west sides of the white sand-covered grounds. In addition, there are 25 other sanctuaries of this shrine. The Aoi Matsuri held jointly by the shrines Kamigamo-jinja and Shimogamo-jinja every 15 May is one of the most important festivals in Kyoto.